Earle Vincent was born in Lymington, Hampshire, in 1838. He was the son of brewer Earle Vincent and his wife Henrietta. In the 1841 census Earle Vincent Snr aged 40, and Henrietta, aged 30, were living in Lymington with their young family; Earle aged 3, Henrietta aged 2, Harriet aged 1 and 6-month-old Louisa. By 1851 Earle Vincent Jnr was a boarder at a private school in Brook Street, Bishops Waltham, Hampshire, run by Church of England clergyman William Allen. By 1861 Earle was living in Victoria Street, New Windsor, Berkshire, with his two sisters Henrietta and Flora. He gave his occupation as brewer's clerk. He worked at the Victoria Brewery, Windsor. In March 1863 Timothy Huffam sold the Royal Osborn Steam Brewery to 25-year old Earle Vincent and the handover was announced in the 17 March 1863 edition of the Western Flying Press (see Gallery). Note that in the announcement Earle stated that he was "Manager at the Victoria Brewery, Windsor, for the last four years" - perhaps something of an exaggeration? In the spring of 1864 Earle married Martha Fowle at Andover, Hampshire, and moved to Yeovil where their two daughters were born; Sophia Fowle born in 1865 and Henrietta born in 1866. However Martha died in the winter of 1867 and in the 1871 census Earle Vincent was living at Osborne House, Sherborne Road, next door to the Royal Osborne brewery. He was listed in the census as a 33-year-old widower with his two daughters, his sister Augusta, a cook and a housemaid. Earle described his occupation as Brewer. Earle was a Freemason, initiated into the Lodge of Brotherly Love in Yeovil on 21 February 1877. In the spring of 1872 Earle married Emma Rawlins of Yeovil at Bedminster, Bristol. In the 1881 census Earle and Emma were living at Osborne House with their three children; daughter Eiline aged 7, Earle aged 6, Henry aged 1 and three general servants. Earle Vincent described his occupation as 'Brewer employing ten men'. His daughters Sophia and Henrietta were absent for this census but were listed in the 1891 census. 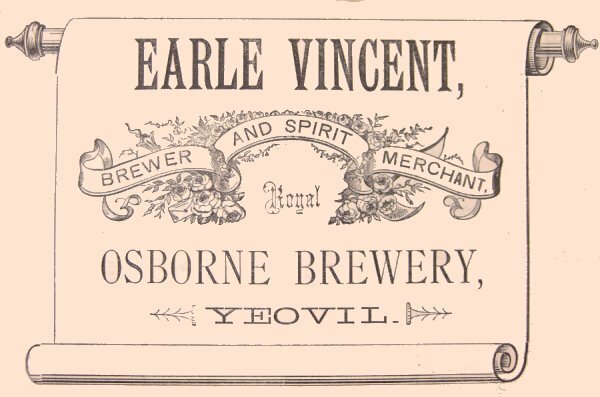 This brewery, the property of Mr Earle Vincent, has been for upwards of twenty-eight years under his proprietorship, was sounded about sixty years ago, and is complete in every department, the entire brewing plant being constructed according to the latest scientific principles. The management is in competent and practical hands, and the systematic arrangement of the brewery, and the employment of nothing but pure water, malt and hops in the manufacture, results in the production of a beverage as pure as it is wholesome, as nutritious as it is invigorating and appetising, qualities the public have not been slow to appreciate. known wine shippers, and his brandies, Scotch and Irish whiskies, gin and other spirits, are obtained from first-class distilleries only. Mr Vincent extends a personal supervision over every branch of the business, which has contributed to the achievement of a substantial commercial success. Earle Vincent died in the summer of 1893 aged 55. Following his death his estate was sold (the sale details are shown in the gallery) - It included the Royal Osborne Brewery, four freehold public houses; the Elephant and Castle Hotel, the South Western Inn, the Butchers Arms Inn and the Foresters Inn at East Coker. Several leasehold public houses including the George Hotel, the Castle Hotel, the Albion Inn, the Black Horse Inn, the London Inn, the King's Arms, the Victoria Inn and the Rock Inn at Stoford. Also Osborne House, Osborne Villa and substantial land holdings as far as Newton Road that would eventually house the Western Gazette building and Aplin & Barrett's factory. The estate sold for a total of £9,865 (around £7 million at today's value) and bought by Jonathan Drew Knight, brewer of Shepton Mallet. The notice placed in the 17 March 1863 edition of the Western Flying Press by Timothy Huffam and Earle Vincent, informing of the takeover of the brewery. This advertisement features in my book "A-Z of Yeovil"
Earle Vincent's advertisement in the 1878 edition of Whitby's Yeovil Almanack Advertiser. 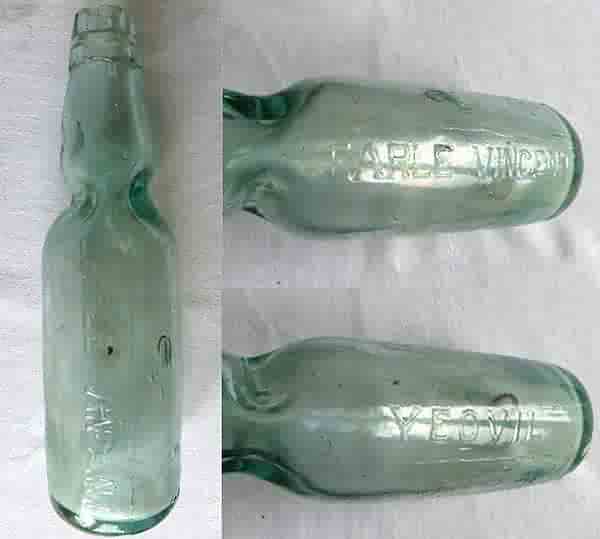 A Codd bottle with Earle Vincent's impressed label, probably from the 1880s. Made by Dan Rylands of Barnsley. In 1872, British soft-drink maker Hiram Codd of Camberwell, London, designed and patented a bottle designed specifically for carbonated drinks. The Codd-neck bottle was designed and manufactured to enclose a marble and a rubber washer / gasket in the neck. The bottles were filled upside down, and pressure of the gas in the bottle forced the marble against the washer, sealing in the carbonation. The bottle was pinched into a special shape, as can be seen in the photo, to provide a chamber into which the marble was pushed to open the bottle. This prevented the marble from blocking the neck as the drink was poured. The property sale of Earle Vincent's estate from the 2 October 1894 edition of the Exeter & Plymouth Gazette. It included the Royal Osborne Brewery, several public houses and beerhouses, Osborne House, Osborne Villa and substantial land holdings as far as Newton Road.